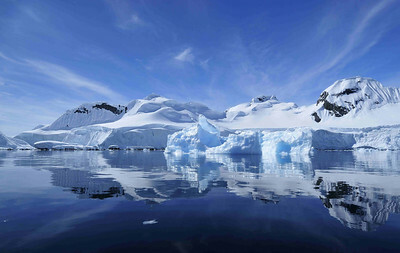 Antarctica is addictive, as most polar tourists find after their first trip. The addicts include Scott, Shackleton and many of their men, who followed them literally to the ends of the earth, on repeated occasions! The record, I believe, goes to James Wordie, a Scottish geologist, who was with Shackleton on the Endurance, and sailed on no less than nine polar expeditions. 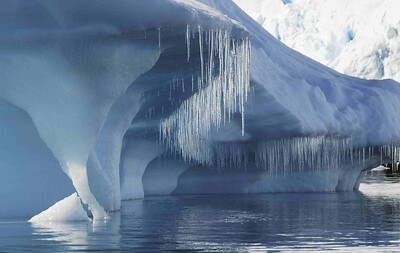 From the thousands of digital and film images I have taken of Antarctica, I believe these are the most worthy to share. The scenery and weather constantly change, and the light is so clear at times, it is very difficult to judge distance, so that the small ridge just ahead may be a large mountain range twenty or fifty miles away! I don’t think there would be the space for me to catalogue a specimen picture of every Antarctic animal, but some lend themselves more than others to making engaging images. Penguins, especially the smaller ones, appear permanently puzzled, while the Emperor chicks must be in the contest for the cutest baby animals on the planet. Albatrosses are impressive to see, and even more impressive when you understand their peripatetic lifestyle. Elephant seals are very cute as pups and weaners, but grow into massive beasts who can be a threat to buildings and fences, not to mention personal safety, on Macquarie Island. The leopard seal could be from central casting, being the large sinister predator from the icy world. 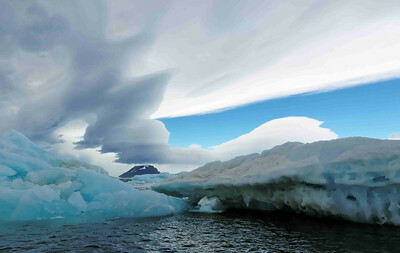 When the katabatic wind blows down from the Antarctic plateau, it can reach speeds in excess of 100 kilometres an hour, and produce some seriously bad weather, and dramatic sky. Some grounded old iceberg and some dirty sea ice here frame a view of Cockburn Island in the Weddell Sea, with high winds churning the sky. 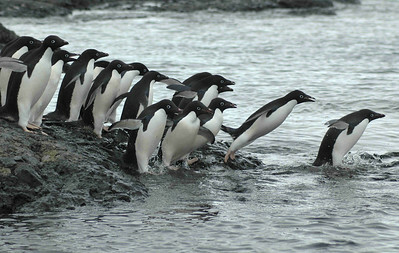 Adelie penguins (Pygoscelis adeliae) are the archetype black and white penguins. They number about 2.5 million pairs, and breed on the coast of Antarctica and the coastal islands. They are one of the favoured preys of the leopard seal, and enter the water in numbers to increase their chance of surviving this dive. Here they are going in, after waiting and playing a game of “You first, no, you etc”, hoping the leopard seal in the shallows has gone away. 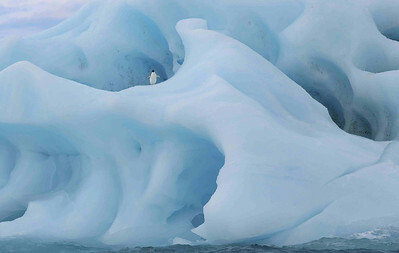 If you ask people what they associate with Antarctica, the usual answer is “Penguins and Ice!” On this day at Brown Bluff in the Weddell Sea, we cruised in a rubber boat to look at this interestingly blue stranded iceberg, and a solitary Adelie penguin (Pygoscelis adeliae) popped up from inside. He (or she) seemed quite interested in us, and watched us go by, but perhaps only wanted to check our visitors’ permit! 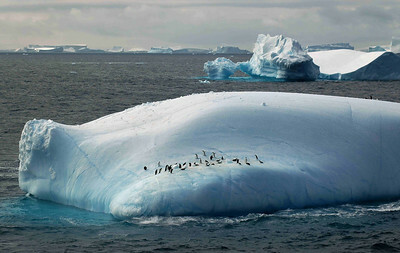 These Adelie penguins are well and truly safe from orca and leopard seals on this ice berg in the Weddell Sea. They can leap over a metre vertically from the water to get onto ice, but don’t always land neatly. 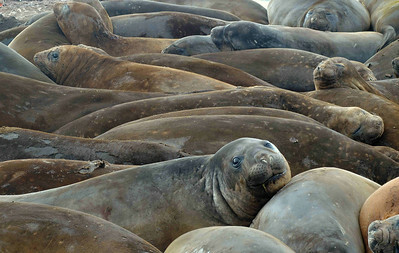 Southern Elephant Seals (Mirounga leonina) haul out of the ocean in December and January to moult, returning to the water after 21 days or so. Being social animals, they lie around in wallows making a good deal of noise and smell during their time ashore. 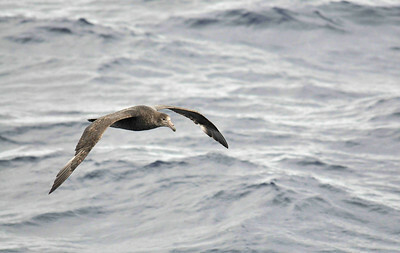 The Light-Mantled Sooty Albatross (Phoebetria palpebrata) has an endearing appearance, enhanced by its white eye patch. These two King Penguins (Aptenodytes patagonicus) display the brighter colours which distinguish them from the larger Emperors. 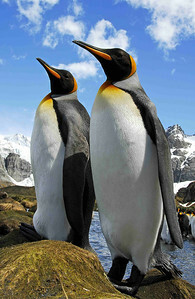 Kings are sub-Antarctic and are found in large populations on South Georgia, Macquarie Island and other sub-Antarctic islands. 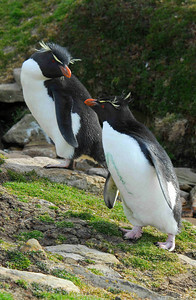 Rockhopper Penguins (Eudyptes chrysosome) are one of the six crested penguin species and are essentially sub-Antarctic in habitat and biology. They featured in Happy Feet, and appear fierce (but are not! ), due to the bright red irises of their eyes. Gentoo Penguins (Pygoscelis papua) are one of the three species of “brushtail” penguin, (the others being the Adelie and the Chinstrap) and breed in the Antarctic summer. There are colonies on both the sub-Antarctic islands, and on the Antarctic continent and islands of the Peninsula. 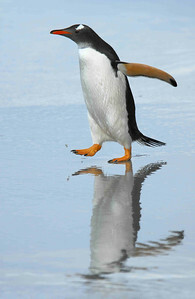 This one is taking a stroll along a beach in the Falkland Islands. 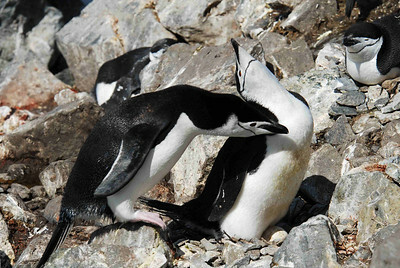 The aptly named and easily identified Chinstrap penguins (Pygoscelis antarctica) live in colonies on both sub-Antarctic islands and the mainland of Antarctica itself. They pair for life, and produce two eggs each season. 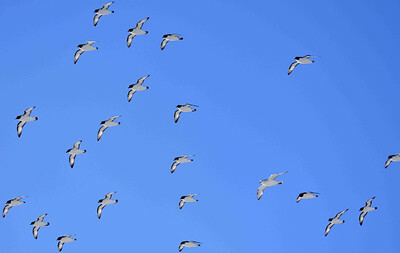 The estimated breeding population is about 7.5 million pairs. It’s difficult to conjecture how this ice formation came to form , but one assumes that various melting, capsizing, capturing and refreezing mechanisms have contributed. Coupled with the angry sky erupting behind, one’s imagination can run wild! 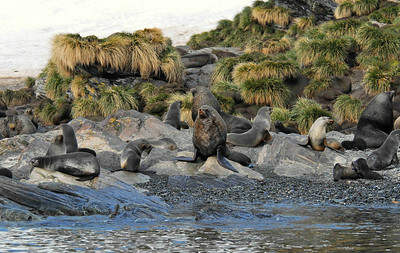 The Antarctic Fur Seal (Arctocephalus gazella) was decimated by the sealing trade in the early 19th century, but has rebounded to a current population of perhaps 4 million. 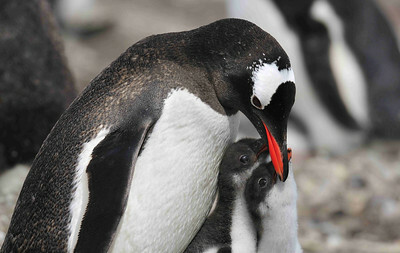 They breed on sub-Antarctic islands in November –December, living in colonies with dominant males acquiring harems of breeding females with their pups. 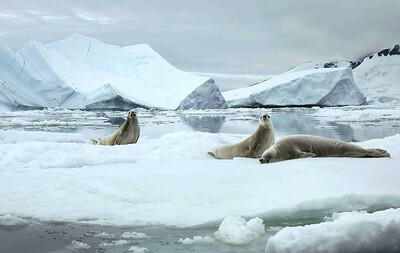 During the (relatively) warmer summer months, the ice on the stranded icebergs melts during the day, and then refreezes when the air cools again, usually during the short summer night. 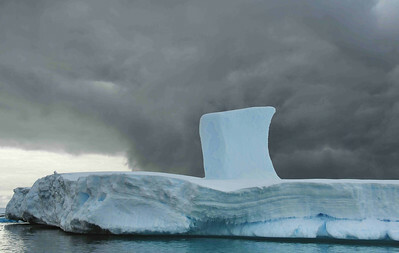 This stranded berg shows evidence of melting by tidal action, hollowing out the underside, and refrozen icicles on the shaded side of the berg. This was taken from a kayak, being careful not to get underneath the overhang. The “brushtail” penguins usually lay two eggs each year, and if it is a good year, rear both chicks. One chick is usually slightly larger (the first to hatch), and in a bad year the smaller chick is “let go”, to feed the larger one, ensuring at least one survives. 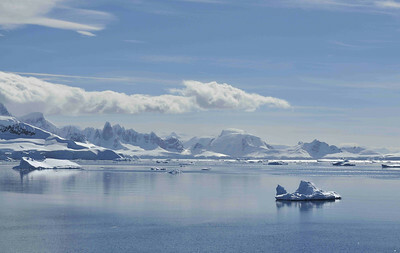 Cruising or kayaking through the glassy waters of the bays on the Peninsula is one of the highlights of Antarctic tourism. On a still big blue day, you can imagine yourself as alone in the world, contemplating the reflections of the myriad shades of blue produced by the ice. On a big blue day, the Antarctic is like a millpond, here at the entrance to Wilhelmina Bay on the west side of the Peninsula. The air is so clear, it is difficult to judge distance without any cues for size of objects etc. The round top mountain just to the right of centre is probably at least twenty kilometres away! The Southern Giant Petrel (Macronectes giganteus) is distinguished from the albatross family by its hump and more obvious “tubenose” beak from which it excretes salt, after drinking sea water. The colour can vary from dark brown to almost white. 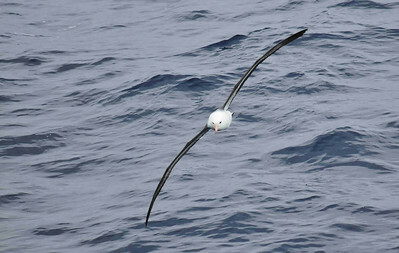 Black-browed Albatross (Thalassarche melanophrytes) breed on sub-Antarctic islands, and are usually the first albatross spotted following the ship by Antarctic tourists. It is known to be one of the most common species taken as longline bycatch, and its numbers are in serious decline. 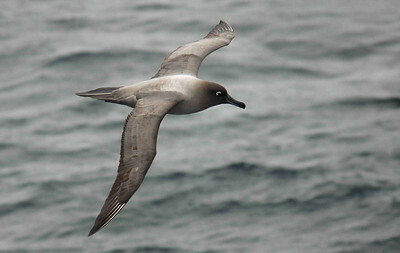 Southern Fulmars (Fulmarus glacialoides) are gull-coloured petrels found in sub-Antarctic waters and coastal Antarctica. They often fly with Cape Petrels (Daption capense) which can be seen in large numbers in sub-Antarctic waters. Neither species seems to be in any danger. 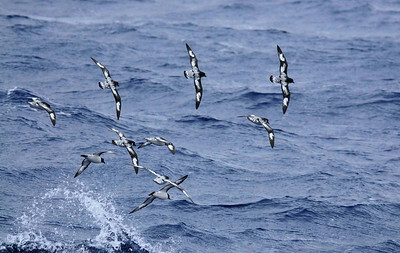 Cape Petrels (Daption capense) can congregate in large numbers, and circle ships, riding on the upcurrents created by the superstructure, and the bow wave. They are incredibly acrobatic and skim the waves effortlessly.